Waking up to the sound of a mechanical watch will make just about any collector a morning person. A traditional complication, the alarm has inspired several modern watchmakers, and earlier this year, one of the boldest independent brands unveiled its own interpretation. The Cyrus Klepcys Réveil, French for alarm, is based on one of the brand’s first models. Known for housing the brand’s moon-phase complication, and later complemented by other planetary phases, the Klepcys returns five years after its invention to house yet another complication. This year, and under the new leadership of Ruben Mira, the brand continues to demonstrate great skill, but is sounding the alarm by introducing a new movement. And already, the Réveil seems to have woken a few people in the watch industry. Presented in a new case, which has been reviewed to fit on slimmer wrists, the Klepcys Réveil strikes a remarkable balance between tradition and modernity. Setting the stage, the two crowns opposite one another, surround the stainless steel and DLC-coated case of the watch. Offsetting its monochromatic tone, colorful indications bring clarity to the most important elements of the watch, the day/night function at 11 o’clock, the 24-hour alarm at 4 o’clock and the on/off function at 7 o’clock. Meanwhile facetted, shot-blasted and brushed hands with Superluminova tips display the time. Orchestrating this mechanical quartet, the alarm hammer at 8 o’clock can be admired striking during 16 seconds. The alarm is powered by calibre CYR1280, a manually wound movement developed together with Jean-François Mojon, an award-winning watchmaker and the father of several movements at Cyrus. It boasts an incredible power reserve of 72 hours, meaning you won’t need to reset the alarm every night. 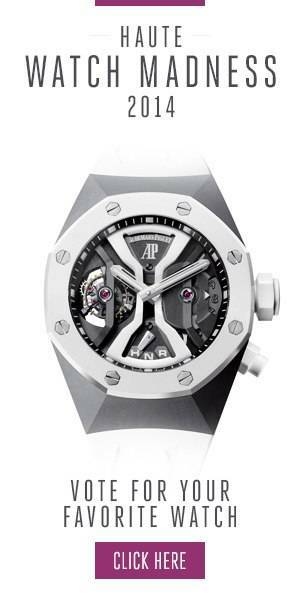 The Cyrus Klepcys Réveil is a limited edition of 30 pieces. Photo Credit: Haute Time. For more information, please visit the official Cyrus Watches website. Follow Haute Time on Instagram to catch all of the new releases as they happen.